What a breathtakening light and dreamlike view and feeling! pracuje 7X14, tak bedzie do konca lata. Chyba ze...wygram w totka, jesli podeslesz mi dobre numerki 6 z 49,pojedziemy poszlajac sie po swiecie az wydamy wszystkie pieniazki. ps: O tak Shirley wezmiemy ze soba jako tlumacza. Chociaż późno, ale bardzo serdecznie dziękuję za miłe słowa. AMAAAAAZING work !!!!.. Super colors and a very well thought-of composition !! I will see your work in more details later (gotta rush now !!).. added you as a friend. Alez ze mnie gapa na potege,jak takie Cudo mozna przegapic, moje najserdeczniejsze gratulacje Violu,gratulacje i uklony. pozdrowienia gorace z okazji Swiat Wielkanocnych. Wspaniala kolorystyka i swietna kompozycja! Great capture! Excellent colors and light. I thank you for so many nice words beautifully and for the kindness. Congrats BIP, very beautiful shot, almost surreal. Colours and composition excellent. Title of picture appropriate too, well done indeed. Hey, I was partially disconnected from the pictures just to contemplate my ideas but seems I've missed a lot of good stuff. Take my late but true congratulations on your BIP. This is really very nice job. Congrats on the very well deserved award Violetta. The warmth and atmosphere of this image is so striking. Amazing colours. A magical shot of warm and golden-red hues and glorious color very well presented. Congratulations on your award! omg! what a beutiful antrum...? where did u capture this shot...sure ++++++++7 i look forward to. one day being able to take the same photo! Another wonderful picture. Beautiful colors and tones. Also congrats for this excellently image. Dzięki komentarzom do krakowianki trafiłam do pieknej galerii!!! Very nicely done, Violetta! A very evocative shot, and also fantastic colour! Splendid colours and lovely composed - great image Violetta! We just dont get that fall colours here in South Africa! Regards. Stunned work you've done here. The colours and the contrast are perfect, i like it, well done Viola. Very nice Violetta, such lovely colours. I agree with Rick about trimming a little off the top, but I like the swan, it gives a reason for where she is looking. Beautiful composition. Very nice colours and tones. Mist creates a great atmosphere. Thank You very much:)I will work out with this painting. I think that Your proposal is good. I love it Viola ~ the colour and mist give it a quiet dreamlike feel and the swan adds a point to where the lady is looking ~ great shot! 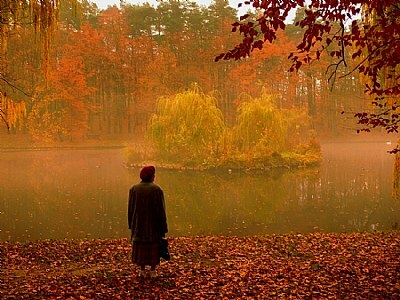 Viola Viola, I am fallen in love with your autumn images! I love all of them. This has a full red atmosphere delightful and original. A photo with a big personality for my taste. uwielbiam Twój zachwyt dla jesieni i umiejętność dzielenia się nim...Kolejna, wielka praca, przesycona ciepłem i nostalgią....Wspaniała kompozycja i nastrój! Ogromne gratulacje ! very nice shot, Violetta... well composed. beautiful colors and athmosphere! i like the light fog on the water... and also the swan in the background! I don't think there's anything wrong with the colours or contrast: I think it lends a dream-like quality to the whole thing. I love her red cap! It might be better without the slightly distracting swan, and also a crop of the top half inch or so to get rid of the white sky: without it, it makes the woods seem thicker and the scene more closed off from the world and reality. I really like the mood here a lot, though: fabulous location and a great picture! It would have been outstanding if you wouldn't have pushed in such a way colors an contrast. A different color tone. But I like it. good composition as well.